Much as the mainstream media would like to fudge it with talk of "former Yugoslavia", the fact that Croatian weapons have found their way to the Syrian jihadists is becoming more difficult to deny. The Croatians themselves, in fact, aren't even bothering to try. The Zagreb daily Jutarnji List (The Morning Paper) published a story on March 7, explaining where the weapons came from, who delivered them and how, and who was behind it all. The original article can be found here. My translation follows below. In four months, 75 airplanes with 3,000 tons of weapons departed Zagreb Pleso airport for Syria in the past four months. Between the beginning of November last year and February this year, altogether 75 civilian cargo planes departed Zagreb's Pleso airport, loaded with weapons for Syrian rebels, Jutarnji has learned from diplomatic sources. In addition to Croatian weapons, the aircraft carried weapons from other European countries, gathered in the organization of the United States of America. According to our sources, the first two or three deliveries went via Turkish Cargo, a subsidiary of Turkish Airlines. Subsequent deliveries were made via Jordanian International Air Cargo. Related story: NY Times on our soldiers withdrawal from Golan: "Our report compromised safety of Croat Blue Helmets"
Until recently, it was thought that a high-raking Croatian official had arranged with his American colleagues the transport of surplus Croatian arms to the Syrian rebels, which was reported by the New York Times. Reliable diplomatic sources indicate, however, that the plan to arm the Syrian rebels was part of a broader context. Namely, American officials had enlisted several partners - Croatia, Saudi Arabia, Jordan and Turkey - to arm the opponents of the Syrian regime. The USA organized the procurement of weapons, the Saudis paid for it, and Jordan and Turkey made the deliveries, via Jordan, to Syria. Croatia had a dual role. It supplied part of its weapons surplus, including the M79 and RPG-22 launchers, and M60 recoil-less cannon. A yet unknown quantity of those departed from Pleso in early November last year, on a Turkish A310. 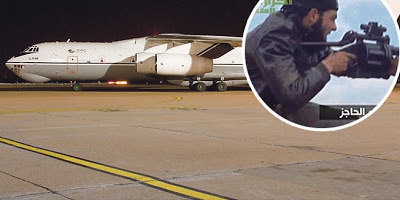 However, the Americans organized deliveries of weapons from several other European countries, including the UK, to Pleso, from where it was loaded into Jordanian cargo plans and sent to Syria via Jordan. Related story: CROAT WEAPONS TRANSFERRED TO SYRIAN REBELS: Everything arranged last summer in Washington! Thus it could be said that Pleso has been the international hub of arms deliveries to the Syrian rebels, over the course of several months. As the cargo aircraft involved were A310 and Ilyushin 76MF, it is estimated that around 3,000 tons of weapons and ammunition have been transported on 75 flights. YouTube videos confirm that the Syrian rebels are receiving large quantities of arms and ammunition. Videos show the rebels bragging about the new weapons they have received. Western media claim that Americans and Turks have organized the weapons deliveries. As our sources tell us, the security of the operation came into question after the Bosnian air traffic control started making inquiries about the large number of Jordanian cargo flights from Zagreb. Nor did the sudden frequency of Jordanian cargo flights go unnoticed among the Zagreb populace. Our sources indicate it isn't know exactly how many of the weapons ended up with the Western-backed Free Syrian Army, as opposed to several dozen militant jihadist militias, also fighting against the Syrian regime. Recent YouTube videos suggest that part of the weapons that came from Croatian stores ended up with the jihadist movement Ahram al-Sham. This was confirmed by their spokesman, who said they shared weapons with the Free Syrian Army. There have also been allegations that some of the weapons that reached Syria via Zagreb have ended up with the Yarmuk Martyrs' Brigade, the jihadists who seized 30 Filipino UN peacekeepers on the Golan Heights two days ago. Afraid that the weapons might end up with militants, most Western politicians insist on keeping the EU's embargo on exports to Syria. Croatia has stated its support for the embargo, and is technically not in violation of it, since the weapons were sold to Jordan. The entire affair has demonstrated that Croatia is a reliable partner of the United States. Washington has played a crucial role in Croatia's admission to NATO and subsequently the EU. Additionally, the U.S. Department of Defense is greatly supporting the Croatian Army in Afghanistan with weapons and equipment, and provides free transport to our troops that are part of the ISAF. So it is natural that Croatia, as a faithful ally, positively responded to the American request for taking part in a weapons delivery operation for Syria. President Josipović has requested parliamentary confirmation of his decision to withdraw 97 Croatian soldiers from the UN mission on Syria's Golan Heights. He justified the decision by the deteriorating security situation in the Golan, and argued that withdrawing the soldiers would remove them from danger. The Sabor is due to debate the decision in their next session, and confirmation requires a two-thirds majority. If the Sabor rejects the President's decision, the soldiers will remain in the Golan. The withdrawal from UNDOF mission was announced last week by Prime Minister Milanović, who said it was the consequence of media reports of Croatian arms deliveries to Syrian rebels. The military command is already preparing for the withdrawal, and Defense Minister Ante Kotromanović announced the soldiers could return within a month. The retreat will be organized via Israel. For the record, here's the Daily Telegraph's version of the story. Interesting I haven't actually heard about this. De-construct.net ran an article a couple of years ago of a Bolivian TV reported accusing Croatian mercenaries and a businessman of smuggling weapons to destabilise the country. Here we are over 2 years later and the Croats are feeling the LOVE of the Syrian refugees from the war in Syria. Somehow, I hope the Croats really love being in the pathway to Germany, the country they so loved during WWII. America's "friendship" does so often leave one a bit deflated. "Human rights and American values"